Appearance: 6’2”, 210 lbs, Forest Green hair and hazel eyes (for most of the time) that seem to change every once in a while to a different color. He wears green shoes, dark jeans, and a light green shirt. He occasionally wears an emerald green cloak. History: Emerald was never someone who misbehaved, nor anyone who stood out in a crowd. It isn’t like he tried hiding or sticking to the shadows, he just wasn’t interesting. When growing up he always tried to do well in everything he did whether it be related to school or house work. He never disobeyed what his elders told him to do, always following the law and home rules. One day near the beginning of his years at Sanctum academy one of his friends was forced into robbing a dust shop and the school found out a student helped with the robbery. Emerald couldn’t let the school find out about his friend (who was a weakling) being involved in the robbery, so he “admitted” to robbing the shop to save his friend. However, the investigators wanted to know who else was in the robbery and where the dust was, but Emerald wouldn’t (couldn’t) give them any information. So they took violent measures into getting him to talk (think of the Beacon Guard). After a day of this and they couldn’t get any information out of him they left him unconscious in a cell, hoping that he will eventually give them information. When Emerald finally became conscious there was a new voice in his head. Not a good one, but a mischievous one (Almandine). This voice told Emerald that he would get him out of the cell without any more pain for him. Emerald caved and Almandine smooth talked his way out, saying that the White Fang forced him into helping rob the Dust shop, but they didn’t let him have any rewards. This proved to not be good for Emerald because now Almandine is always thinking up new things to do that are illegal and immoral. When the final end of the year tests (physical tests) were coming up at Sanctum, Emerald spent a week without sleep or food, and instead trained day and night trying to be the best fighter in his class. Finally his body gave out on him and he collapse on the training ground out of exhaustion. When he woke up in an infirmary, he was greeted in his head not just by Almandine but a lazy, tired sounding voice (Lapis). Emerald asked why Lapis was in his head now, to which Lapis answered that he worked his body too much and the stress caused him to have a voice that advised him when he was working to hard. He then said that Emerald needed more sleep and to get some food in him. This seemed like good advice at the time, but Lapis stayed with this advice all the time, even when it wasn’t needed. After passing his tests with flying colors, Emerald had to decide whether or not to apply to Beacon. He was all for it, Lapis just wanted to sleep all the time, and Almandine wanted to use his abilities to rob a bank. Emerald was completely against this idea but Almandine wasn’t backing down. They argued for 2 days on what to do giving Emerald the worst headache he ever had and a ton of stress, eventually his mind couldn’t take it and he passed out. Waking up he was doomed to find a third voice interrupting his own thoughts. This one, a shy and quiet voice (Topaz), told Emerald that he was there because of the argument between him and Almandine. Topaz is the part of Emerald that was considering to do what Almandine wanted out of fear. Since Topaz was split from Emerald’s personality, he decided to join Beacon, against the wishes of Almandine. Emerald is now joining as a Beacon student as his sanity slowly crumbles. Personality: Emerald is a regular guy who is kind unless provoked, loyal to his friends, and caring when someone is in need, sadly it’s not just his personality that is present in his mind. -Almandine: This personality was the first split off from Emerald’s sanity. He is partially evil but more mischievous than anything else. He always thinks up the worst possible ideas that Emerald could and (in his opinion) should do. (i.e. violence, thievery, and fade to black moments). Created when Emerald was being interrogated by the investigators. -Lapis: This personality is the lazy one. Always trying to convince Emerald to go to comfortable spots to sleep and or put off work. He doesn’t really care about other people’s problems, so he generally advises against helping them. Then again, he advises against doing most things other than sleeping and eating. Created when Emerald didn’t stop to eat or sleep for a week and instead trained. -Topaz: The final personality in Emerald’s head before he joined Beacon. He is shy and unsure. He is always questioning decisions that Emerald makes and he is afraid of meeting new people. Created when Emerald and Almandine had two days of stressful arguing of either applying for Beacon or robbing a bank. -Amethyst: He is the first personality Emerald gets during his time at Beacon. He is the inspirational and reckless part of Emerald (think of Sarge from RvB). 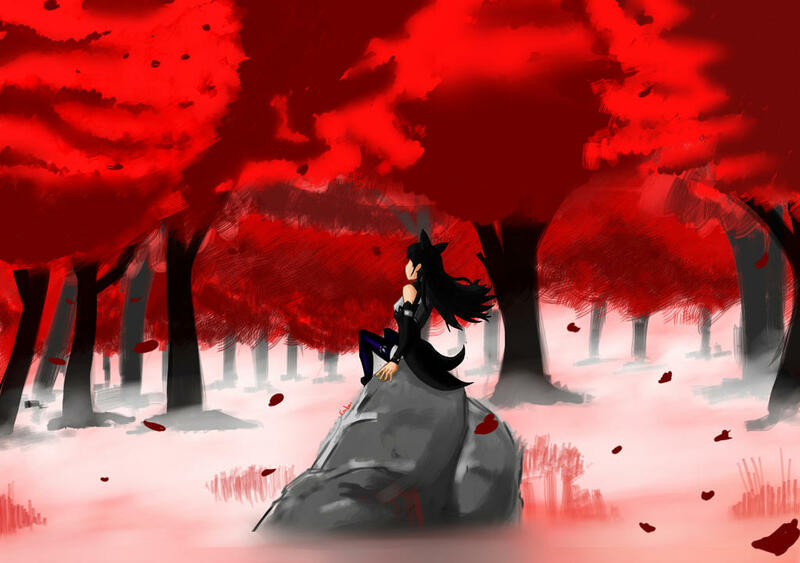 During an experiment that Emerald participated in he got sucked into the mind and imagination of Byron Hatter (http://rwby-rpg.forumotion.com/t745-hunters-in-wonderland-plot-invite-only). During his time there, he faced an enemy he could not beat through all his planning. When he is just about to give up, Amethyst shows up and gives a big speech about why he can't give up. He tells Emerald to stop planning and go on instinct. Other personalities might appear throughout his time at Beacon. Strength: Emerald can fight very well with a sword, is very strong (can carry twice is weight for over an hour), and a high center of balance. His usual fighting style is very similar to fencing. Weakness: He only has a little bit of practice with his ranged weapon, Răbdare. His aim is about a foot off of target at 15 meters and increasingly gets worse as the distance becomes greater. He is a bit slow in fighting because of his size. It is difficult for him to have a conversation with others because of the voices in his head. He is prone to get headaches daily. Semblance: Fragmentation: In times of great need Emerald can activate his semblance, which causes his personalities to manifest themselves by his side to help him fight for up to 10 minutes. If he summons them for reasons that don't involve fighting/a lot of physical activity, they can be outside his head for 40-50 minutes at a time. When seen they look like him but their hair and eye color are that of their text color. Even though they have the same strengths/weaknesses of Emerald, multiples of him can be hard to defeat. Even though they have the same strengths and weaknesses, they will dissolve (a.k.a. defeated and returned to his mind) if they are either hit 3 times with a ranged weapon, 6 times with a body part (punch, kick, etc. ), or 1 time with a melee weapon. These are the only times that they can actually get along and work together. 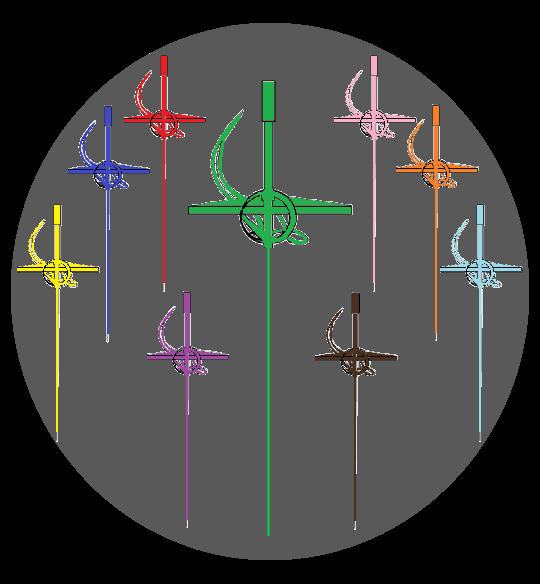 Primary weapon: Caritatis (charity in latin; virtue for greed) is a green sword made of a light but durable metal, held in Emerald’s left hand. It is a sword that Emerald uses in a fencing style. Secondary weapon: Răbdare (Patience in Romanian; virtue for wrath) is a neon green gauntlet on Emerald’s right arm that shoots shurikens of the same color when he closes his fingers into a fist. Secondary weapon (Secondary Function): Răbdare can also (after Emerald hits a button on the bottom of the gauntlet with his left hand) shoot a grappling hook with 50 meters of a thin, but strong metal rope. This can help Emerald move around and help with his fighting. The grapple shoots when he closes his fingers into a fist. It latches onto whatever it hits automatically. It will detach if he opens his thumb and it will be pulled back to Răbdare (or pull Răbdare to it) when the fingers open up. History: Caritatis was a weapon handed down by Emerald’s grandfather, which is why it doesn’t change into anything. Răbdare was made by Emerald during his time at Sanctum when he realized that everyone else had cool weapons. He decided he wanted a ranged weapon, but also a faster and easier way to travel. Just a quick question: Do Emeralds other personas have the same strengths and weaknesses as Emerald? Yes, they are basically copies of him just with different opinions, hair color, and eye color. Would you like me to include that in the original post? Your semblance can be used to create 3 copies of yourself who are of equal power? That's quite powerful, even if your character is only of average strength and speed. They need some sort of weakness, like they can't take a punch, or can only take very, very little damage. Alternatively, any damage they take, you take as well. On that same note, your weakness isn't really a weakness. Having average strength and speed is average, not a weakness. Change/reword this. Edit: -I switched one of Emerald's strengths (his ranged weapon) and put it as a weakness. -Changed his weight (+30 lbs.) to fit his strengths/weaknesses. -Made personalities in semblance easier to defeat. Semblance: Fragmentation: In times of great need Emerald can activate his semblance, which causes his personalities to manifest themselves by his side to help him fight for up to 1 minute. When seen they look like him but their hair and eye color are that of their text color. Even though they have the same strengths/weaknesses of Emerald, multiples of him can be hard to defeat. Even though they have the same strengths and weaknesses, they will dissolve (a.k.a. defeated and returned to his mind) if they are either hit 3 times with a ranged weapon, 6 times with a body part (punch, kick, etc. ), or 1 time with a melee weapon. These are the only times that they can actually get along and work together. Secondary weapon: Răbdare (Patience in Romanian; virtue for wrath) is a neon green gauntlet on Emerald’s right arm that shoots shurikens of the same color. Secondary weapon (Secondary Function): Răbdare can also (after Emerald hits a button on the bottom of the gauntlet with his left hand) shoot a grappling hook with 50 meters of a thin, but strong metal rope. This can help Emerald move around and help with his fighting. -Made the "clones" able to stay "alive" for a more reasonable fight time. -Made the clones be able to stay alive longer for non fighting occasions (easier to make them talk to others). -Made Răbdare's functions a lot easier to explain so it doesn't just shoot, grab, and pull. This way it differentiates the uses of the weapon. Added Amethyst, Emerald's newest personality. He shows up in the thread later on then where the plot is currently, but I was tired of avoiding using him for threads later on in the timeline. Once he actually shows up, I'll edit more detail into his joining, if it needs it.